others a few hours in Luxembourg City, ice cream in several flavors, well-watered beer, and the dubious pleasure of hearing accordionists squeeze out German waltzes and Yankee marching songs of World War I vintage. Replacements, now by order named "reinforcements," joined the division, but by mid-December the regiments still averaged five to six hundred men understrength. Infantry replacements were particularly hard to obtain and many rifle companies remained at no better than half strength. Equipment, which had been in use since the Normandy landings, was in poor condition. A number of the divisional vehicles had broken down en route to Luxembourg; a part of the artillery was in divisional ordnance shops for repair. When the Germans attacked, the 70th Tank Battalion, attached to the 4th Division, had only eleven of its fifty-four medium tanks in running condition. Neither the 83d Division, which the 4th had relieved, nor any higher headquarters considered the Germans in this sector to be capable of making more than local attacks or raids, and patrols from the 4th Division found nothing to change this estimate. Even so General Barton made careful disposition of his understrength and weary division, even ordering the divisional rest camps, originally back as far as Arlon, to be moved to sites forward of the regimental command posts. Since any static linear defense was out of the question because of the length of the front and the meandering course of the two rivers, Barton instructed his regimental commanders to maintain only small forces at the river outpost line, holding the main strength, generally separate companies, in the villages nearby. Each regiment had one battalion as a mobile reserve, capable of moving on four-hour notice. Each regiment, by standard practice on such a wide front, had one of the division's 105-mm. howitzer battalions in direct support. General support was provided by the division's own 155-mm. howitzer battalion and two additional medium battalions belonging to the 422d Field Artillery Group, but even this added firepower did not permit the 4th Division massed fire at any point on the extended front. Mobile support was provided by those tanks of the 70th Tank Battalion which were operational, the self-propelled tank destroyers of the 803d Tank Destroyer Battalion, and the towed tank destroyers of the 802d. The plans to utilize these positions were briefed by General Barton to his commanders on the 13th. Barton was apprehensive that the enemy would attempt a raid in force to seize Luxembourg City, and in the battle beginning on the 16th he would view Luxembourg City as the main German objective. were many seventeen-year-olds. Unit commanders and noncommissioned officers were good and experienced; morale was high. Although the 212th was at full strength it shared the endemic weaknesses of the volks grenadier division: insufficient communications and fewer assault guns than provided by regulation (only four were with the division on 16 December). Brandenberger rated the 212th as his best division. For this reason the 212th was assigned the mission of protecting the flank of the Seventh Army, just as the latter was responsible for guarding the flank of the forces in the main counteroffensive. More specifically, the Seventh Army plans called for the 212th to attack over the Sauer on either side of Echternach, reach and hold the line of the Schlammbach, thus eliminating the American artillery on the plateau in the Alttrier-Herborn-Mompach area, and finally to contain as many additional American troops as possible by a thrust toward Junglinster. Radio Luxembourg, the powerful station used for Allied propaganda broadcasts, was situated near Junglinster. As in the case of the 276th Volks Grenadier Division, there is no indication that the LXXX Corps expected to send the 212th into Luxembourg City, although the Germans knew that the 12th Army Group Headquarters and the advance command post of the Ninth Air Force were located there. On the night of 13-14 December the 212th commenced to strip its extended front in concentration for its part in the counteroffensive. The 423d Regiment made a forced march from the sector southwest of Trier and by daylight had bivouacked on the right wing of the 212th. The following night all three regiments assembled behind a single battalion which acted as a screen along the Sauer between Bollendorf and Ralingen, the prospective zone of attack. On the final night (15-16 December) the division moved into the position for the jump-off: the 423d on the right, north of Echternach; the 320th on the left, where the Sauer turned east of Echternach; and the 316th in army reserve northeast of the city. The long southern flank of the old 212th Volks Grenadier Division sector had been drastically weakened to permit the concentration at Echternach. Only two Festung battalions were left to cover the twelve miles south to the boundary between the Seventh and First Armies, but in this denuded sector the Sauer and Moselle Rivers afforded a considerable natural defense. The Germans had excellent intelligence of the 4th Infantry Division strength and positions. The Luxembourg-German border was easily crossed, and despite the best efforts of the American Counter Intelligence Corps and the local police the bars and restaurants in Luxembourg City provided valuable listening posts for German agents. It is likely that the enemy had spotted all the American outpost and artillery positions; it is certain he knew that the 212th Volks Grenadier Division would be opposed only by the 12th Infantry during the first assault phase. the battalions was severed. Many radios were in the repair shops, and those at outposts had a very limited range over the abrupt and broken terrain around Echternach and Berdorf, Luxembourg's "Little Switzerland." Throughout this first day the 12th Infantry would fight with very poor communication. The problem of regimental control and coordination was heightened by the wide but necessary dispersion of its units on an extended front and the tactical isolation in an area of wooded heights chopped by gorges and huge crevasses. In accordance with the division orders to hold back maximum reserves, the 12th Infantry had only five companies in the line, located in villages athwart the main and secondary roads leading southwest from the Sauer River crossings to the interior of the Grand Duchy. These villages, at which the crucial engagements would be fought, were Berdorf, Echternach, Lauterborn, Osweiler, and Dickweiler. Actually, only a few men were stationed with the company command post in each village; the rifle platoons and weapon sections were dispersed in outposts overlooking the Sauer, some of them as far as 2,000 yards from their company headquarters. The leading companies of the two German assault regiments began crossing the Sauer before dawn. Apparently the crews manning the rubber boats had trouble with the swift current, and there were too few craft to accommodate large detachments. The immediate objective of the northern regiment, the 423d, was the plateau on which stood the village of Berdorf; beyond this the regiment had orders to cut the road running west from Lauterborn and Echternach and link forces with the 320th Regiment. The latter crossed east of Echternach, its first objective being the series of hills north of Dickweiler and Osweiler. Once in possession of these hills the 320th was to seize the two villages, then drive on to join the 423d. General Barton had warned his regiments at 0929 to be on the alert because of activity reported to the north in the 28th Division area, intelligence confirmed by a phone call from General Middleton. But the first word that the Germans were across the river reached the 12th Infantry command post in Junglinster at 1015, with a report from Company F, in Berdorf, that a 15-man patrol had been seen approaching the village a half-hour earlier. At Berdorf most of Company F (1st Lt. John L. Leake) had been on outpost duty at the four observation posts fronting the river. The company radio was back for repair but each of the artillery observers, forward, had a radio. Either these sets failed to function or the outposts were surprised before a message could get out. The 1st Battalion, 423d Regiment, overran three of the outpost positions, captured the company mortars, machine guns, and antitank guns sited in support of the forward detachments, and moved in on Berdorf. Outpost 2 at Birkelt Farm, a mile and a half east of Berdorf, somehow escaped surprise. Here the 2d Platoon (with twenty-one men and two artillery observers) held out in the stone farm buildings for four days and from this position harassed the Germans moving up the ravine road to Berdorf. Direct assault failed to dislodge these Americans, and the attempt was abandoned pending the arrival of heavy weapons from across the river. gathered about sixty men in the Parc Hotel as the enemy closed in. The Parc was a three-storied reinforced concrete resort hotel (indicated in the guide-books as having "confort moderne") surrounded by open ground. Leake's force had only one .50-caliber machine gun and a BAR to reinforce the rifles in the hands of the defenders, but the Germans were so discouraged by the reception given their initial sorties that their succeeding attempts to take the building were markedly halfhearted. Meanwhile the 7th Company, 423d Regiment, pushed forward to cut the Echternach-Luxembourg road, the one first-class highway in the 12th Infantry sector. This company struck Lauterborn, on the road a mile and a half southwest of Echternach, and cut off the Company G outposts. By 1130 the remainder of Company G, armed with rifles and one BAR, was surrounded but still fighting at a mill just north of the village, while a platoon of the 2d Battalion weapons company held on in a few buildings at the west edge of Lauterborn. Company E, in Echternach, likewise was surprised but many of the outpost troops worked their way back to a hat factory, on the southwestern edge of the city, which had been organized as a strongpoint. The first German assault here did not strike until about 1100, although Echternach lay on low ground directly at the edge of the river. Attempts by the 320th Infantry to make a predawn crossing at Echternach had been frustrated by the swift current, and finally all the assault companies were put over the Sauer at Edingen, more than three miles downstream. This delay brought the advance troops of the 320th onto the hills above Osweiler and Dickweiler well after daylight, and almost all of the American outposts were able to fall back on the villages intact. Late in the morning two enemy companies attacked Dickweiler, defended by Company I, but were beaten off by mortar fire, small arms, and a .50-caliber machine gun taken from a half-track. The Germans withdrew to some woods about 800 yards to the north, ending the action; apparently the 320th was more concerned with getting its incoming troops through Echternach. Osweiler, west of Dickweiler, thus far had seen no enemy. and command messages in addition to its own calls for fire. The gunners nevertheless began to get on the targets, and the German infantry reported very punishing artillery fire during the afternoon. At noon the picture of battle had sharper definition; so General Barton authorized the 12th Infantry to commit the 1st Battalion (Lt. Col. Oma R. Bates), the regimental reserve. At the same time he gave Colonel Chance eight medium tanks and ten light tanks, leaving the 70th Tank Battalion (Lt. Col. Henry E. Davidson, Jr.) with only three mediums and a platoon of light tanks in running order. Small tank-infantry teams quickly formed and went forward to relieve or reinforce the hard-pressed companies. Unfortunately rain and snow, during the days just past, had turned the countryside to mud, and the tanks were bound to the roads. Later Barton phoned the corps commander to ask for reinforcements. Middleton had nothing to offer but the 159th Engineer (Combat) Battalion, which was working on the roads. He told Barton that if he could find the engineers he could use them. Company A, mounted on a platoon of light tanks, was ordered to open the main road to Lauterborn and Echternach which supplied the 2d Battalion (Maj. John W. Gorn). This team fought through some scattered opposition southwest of Lauterborn, dropped off a rifle platoon to hold Hill 313 (which commanded the southern approach), and moved through the village to the Company G command post, freeing twenty-five men who had been taken prisoner in the morning. By nightfall the Germans had been driven back some distance from Lauterborn (they showed no wish to close with the tanks), but the decision was made to dig in for the night alongside Company G rather than risk a drive toward Echternach in the dark. Companies A and G together now totaled about a hundred officers and men. Early in the afternoon Company B mounted five light and five medium tanks and set out to reach Company F. At the southern entrance to Berdorf, which is strung out along the plateau road for three-quarters of a mile, the relief force ran into a part of the 1st Battalion, 423d Regiment, which opened bazooka fire from the houses. When darkness fell the Americans still were held in check, and the infantry drew back, with two tanks in support, and dug in for the night. The rest of the tanks returned to Consdorf for gasoline and ammunition. The morning situation in the sector held by the 3d Battalion (Maj. Herman R. Rice, Jr.) had not seemed too pressing. The 320th had not reached Osweiler and the first assault at Dickweiler had been repulsed handily. But Colonel Chance sent out all of the usable tanks in Company B, 70th Tank Battalion-a total of three-to pick up a rifle squad at the 3d Battalion command post (located at Herborn) and clear the road to Osweiler. When this little force reached Osweiler, word had just come in that Dickweiler was threatened by another assault. The tanks and riflemen proceeded to run a 2,000-yard gauntlet of bursting shells along the high, exposed road to Dickweiler (probably the enemy guns beyond the Sauer were firing interdiction by the map). which was in the process of moving two companies forward in attack formation across the open ground northwest of Dickweiler. The tanks opened fire on the German flank and rear, while all the infantry weapons in the village blazed away. Thirty-five of the enemy, including one company commander, surrendered; the commander of the second company was killed, as were at least fifty soldiers. Later the 4th Infantry Division historian was able to write: "This German battalion is clearly traceable through the rest of the operation, a beaten and ineffective unit." But the 320th Regiment, although badly shaken in its first attempts to take Dickweiler, was rapidly increasing the number of its troops in this area, spreading across the main road and encircling the two villages. About an hour after dark a message from the 3d Battalion reached the 12th Infantry command post: "Situation desperate. L and I completely surrounded." Colonel Chance took Company C, the last troops of the 12th Infantry, and sent them to the 3d Battalion command post for use on the morrow. The 12th Infantry had rigidly obeyed the division commander's order that there should be "no retrograde movement," despite the fact that nine days earlier it had been rated "a badly decimated and weary regiment" and that on 16 December its rifle companies still were much understrength. The 42d Field Artillery Battalion in direct support of the 12th, though forced to displace several times during the day because of accurate counterbattery fire, had given the German infantry a severe jolting. In the face of the German build-up opposite the 12th Infantry and the apparent absence of enemy activity elsewhere on the division front, General Barton began the process of regrouping to meet the attack. There was no guarantee, however, that the enemy had committed all his forces; the situation would have to develop further before the 4th Division commander could draw heavily on the two regiments not yet engaged. The 2d Battalion of the 22d Infantry, in regimental reserve, was alerted to move by truck at daylight on 17 December to the 12th Infantry command post at Junglinster, there to be joined by two tank platoons. The 9th Armored Division loaned a medium tank company from the 19th Tank Battalion, also to report to the 12th Infantry on the following morning. Three battalions of 155's and two batteries of 105-mm. howitzers began the shift north to reinforce the fifteen howitzers supporting the 12th Infantry. And the division reserve, the 4th Engineer Combat Battalion and 4th Cavalry Reconnaissance Troop, concentrated behind the 12th Infantry lines. Most important, just before midnight the corps commander telephoned General Barton that a part of the 10th Armored Division would leave Thionville, in the Third Army area, at daybreak on 17 December. The prospect must have brightened considerably at the 4th Division headquarters when the promise of this reinforcement arrived. The 4th Division would not be left to fight it out alone. reserves to the threatened left flank to block further penetrations and to reinforce and relieve the garrison villages in the north. The 212th Volks Grenadier Division took a shock company from the 316th Regiment, which was still held in reserve under Seventh Army orders, and moved it into the fight. The division fusilier battalion was committed against the 12th Infantry center in an attempt to drive a wedge through at Scheidgen while a part of the 23d Festung Battalion crossed the Sauer near Girst to extend the left flank of the German attack. During the night of 16 December searchlights had been brought down to the river opposite Echternach to aid the German engineers attempting to lay spans on the six stone piers, sole relic of the ancient bridge from whose exit the people of Echternach moved yearly in the "dancing procession" on the feast of St. Willibrord. American shellfire finally drove the enemy away from the bank, necessitating a new effort in broad daylight farther to the north. The enemy infantry would outnumber the Americans opposing them in the combat area, but on 17 December the Germans in the bridgehead would meet a far greater weight of artillery fire than they could direct against the Americans and would find it difficult to deal with American tanks. The superiority in tanks maintained by the 4th Infantry Division throughout this operation would effectively checkmate the larger numbers of the German infantry. 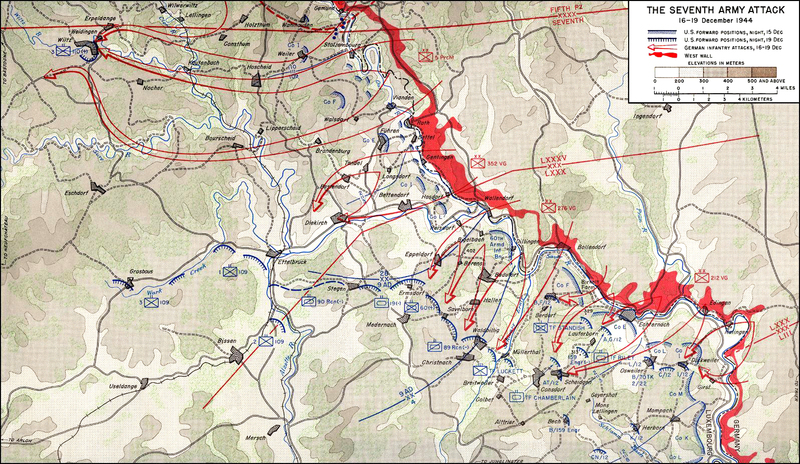 Fighting on 17 December took place along the axes of three principal German penetrations: on the American left flank at Berdorf, Consdorf, and Müllerthal; in the center along the Echternach-Lauterborn-Scheidgen road; and on the right in the Osweiler-Dickweiler sector. About three hours before dawn, General Barton, concerned over his left flank, dispatched the 4th Engineer Combat Battalion and 4th Cavalry Reconnaissance Troop to Breitweiler, a small village overlooking the wishbone terminus of the Schwarz Erntz gorge and the ganglia ravine roads which branched thence into the 12th Infantry flank and rear. The Schwarz Erntz gorge lay within the 4th Infantry Division zone but in fact provided a natural cleavage between the 4th Division and the 9th Armored Division. Both units would therefore be involved in guarding the cross-corridors and ravines which stemmed from the gorge itself. The advance of the 423d Regiment across the Berdorf plateau on 16 December had reached the winding defile leading down into the gorge west of Berdorf village, there wiping out a squad of infantry and one 57-mm. antitank gun which had been placed here to block the gorge road. When the 4th Division reserves arrived in Breitweiler on the morning of 17 December the threat of a flanking move through the gorge was very real but the Americans had time to dig in. arrived from the 9th Armored, the assault gun and mortar platoons of the 70th Tank Battalion, a battery of 105-mm. howitzers, the reconnaissance company of the 803d Tank Destroyer Battalion, and the 2d Battalion, 8th Infantry, were hastily assembled in Colbet, a mile and a half south of Müllerthal, and organized at 1104 as Task Force Luckett (Col. James S. Luckett) . An hour earlier the tank destroyer reconnaissance company had begun a long-range fire fight but the German advance guard, despite heavy shelling from three field artillery battalions and every self-propelled piece which could be brought to bear, drove straight on to Müllerthal. Consdorf, the command post of the 2d Battalion, 12th Infantry, was left open to an attack from Müllerthal up the Hertgrund ravine. Major Gorn organized a hasty defense with a few cooks, MP's, stragglers, and one tank, but the blow did not fall. The 987th Regiment failed to emerge from the gorge and even may have withdrawn from Müllerthal, after beating off the counterattack launched there in the afternoon by elements of the 9th Armored Division. a mystery. Possibly this failure is explained by the lack of heavy weapons needed to blast a way up from the gorge bottom. Possibly the American artillery and self-propelled guns had disorganized and disheartened the German infantry; prisoners later reported that shell fragments from the tree bursts in the bottom of the wooded gorge "sounded like falling apples" and caused heavy casualties. Whatever the reason, this enemy penetration went no further than Müllerthal. By early afternoon, however, a new threat was looming in the Consdorf area, this time from an enemy penetration on the right along the Scheidgen section of the main highroad to Echternach. This turned out to be only a patrol action and the enemy was quickly beaten off. In the central sector Companies A and G, with five light tanks, started from Lauterborn along the road to Echternach. The enemy here was in considerable strength and had established observation posts on the ridges ringing Lauterborn and bordering the road. Heavy and accurate shellfire followed each American move. When the day ended the relief force had accomplished no more than consolidating a defensive position in Lauterborn. In Echternach Company E, 12th Infantry, had occupied a two-block strongpoint from which it harassed the German troops trying to move through the town. No large-scale assault was attempted this day, apparently because the enemy was still waiting for guns to cross the river. Troops from the 320th Regiment and fusilier battalion circled around Echternach and Lauterborn meanwhile in an attempt to cut the main road at Scheidgen. The platoon from Company A, 12th Infantry, which had been posted on Hill 313 the day before, fell back to Scheidgen and there was overwhelmed after a last message pleading for tank destroyers. At the day's end only the regimental antitank company, numbering some sixty men, stood between the enemy and the 2d Battalion command post at Consdorf. to join the two companies beleaguered in Osweiler. As Company C worked its way through the woods south of Osweiler the left platoon ran head on into the 2d Battalion, 320th Infantry; all the platoon members were killed or captured. By some chance the two platoons on the right missed the German hive. In the meantime the 2d Battalion, 22 Infantry (Lt. Col. Thomas A. Kenan), had arrived in the 12th Infantry zone. Company F was mounted on tanks from the 19th Tank Battalion, which had just come in from the 9th Armored Division and also set out for Osweiler. This force arrived on the scene shortly after the enactment of the German ambush fought a short sharp engagement, rescued some of the prisoners from Company C, and pushed on into Osweiler. With this reinforcement a new defensive line was organized on the hills just east of the village. The original defenders had taken a large bag of prisoners the previous day; these were sent back to Herborn with a tank platoon. In midafternoon the remaining companies of the 2d Battalion, 22d Infantry, started for Osweiler, advancing in column through the woods which topped a ridge line running southwest of the village. While the American column moved in a northeasterly direction, a German column, probably a battalion in strength suddenly intersected the 2d Battalion line of march. In the fire fight which followed the 2d Battalion companies became separated, but the early winter darkness soon ended the skirmish. The Americans dug in for the night, and the Germans passed on toward Scheidgen. In Dickweiler the troops of the 3d Battalion, 12th Infantry, had been harassed by small forays from the woods above the village. The three tanks which had come up the evening before, and very effective fire by American batteries, put an end to these German efforts. Thus both Osweiler and Dickweiler remained tight in American hands. Toward the close of day Company C of the 12th Infantry took position on some high ground between and slightly south of the two villages, thus extending the line here on the right. General Barton's headquarters saw the situation on the evening of 17 December as follows. The 3d Battalion and its reinforcements had "a semblance of a line" to meet further penetration in the vicinity of Osweiler and Dickweiler. On the opposite flank things were temporarily under control, with Task Force Luckett not yet seriously engaged and the enemy advance thus far checked at Müllerthal. However, there was a present danger that the large German force might turn the 4th Division flank by a successful attack through the 9th Armored Division blocking position at Waldbillig. All that could be said of the 12th Infantry center was that the situation was fluid, for here the road junction at Scheidgen was in enemy hands and German detachments were on the loose. day it may be said that the German opportunity to exploit the initial surprise and attendant tactical gains commenced to fade. On the morning of 17 December the 10th Armored Division (General Morris) had moved out of Thionville for Luxembourg, the first step (although at the time not realized) which General Patton's Third Army would make to intervene in the battle of the Ardennes. General Morris drove ahead of his troops and reported to General Middleton at Bastogne. The VIII Corps commander originally had intended to use a part of the 10th Armored in direct support of the 28th Division, but now he instructed Morris to send one combat command to the Bastogne area and to commit the remainder of the 10th Armored with the 4th Infantry Division in a counterattack to drive the Germans back over the Sauer. General Middleton regarded the German advance against the southern shoulder of his corps as potentially dangerous, both to the corps and to the command and communications center at Luxembourg City. There was, of course, no means by which the VIII Corps commander could know that the Seventh Army scheme of maneuver was limited to a swing only as far as Mersch, eight miles north of the city. General Morris left Bastogne and met the 4th Infantry Division commander in Luxembourg. The two were of one mind on the need for counterattack tactics and arranged that CCA (Brig. Gen. Edwin W. Piburn), the leading combat command, should make an immediate drive to the north between the Schwarz Erntz gorge and the main Echternach-Luxembourg road. CCA made good speed on the 75-mile run from Thionville, but the leading armor did not arrive in the 12th Infantry area until late in the afternoon of 17 December. Apparently some troops went at once into the line, but the actual counterattack was postponed until the next morning. Then, so the plan read, CCA would advance in three task forces: one through the Schwarz Erntz gorge; one on the Consdorf-Berdorf road; and the third through Scheidgen to Echternach. The infantry to the front were alerted for their role in the combined attack and half-tracks with radios were moved close to the line of departure as relay stations in the tank-infantry communications net. The counterattack moved off on the morning of 18 December in a thick winter fog. On the left, Task Force Chamberlain (Lt. Col. Thomas C. Chamberlain) dispatched a small tank-infantry team from Breitweiler into the gorge. The Schwarz Erntz, taking its name from the rushing stream twisting along its bottom, is a depression lying from three to five hundred feet below the surrounding tableland. At several points canyonlike cliffs rise sheer for a hundred feet. The floor of the gorge is strewn with great boulders; dense patches of woods line the depression and push down to the edge of the stream. In time of peace the gorge of the Schwarz Erntz offered a picturesque "promenade" for holiday visitors in the resort hotels at Berdorf and Beaufort, with "bancs de repos" at convenient intervals. In December, 1944, the gorge represented a formidable military obstacle, difficult of traverse for both foot troops and vehicles, capable of defense by only a few. narrow that the tanks had to advance in single file, and only the lead tank could fire. The accompanying infantry were under constant bullet fire; and when the lead tank was immobilized by an antitank projectile some time was required to maneuver the rest of the column around it. With every yard forward, bazooka, bullet, and mortar fire increased, but the enemy remained hidden. Finally, the Americans halted near the T in the gorge road just south of Müllerthal. It was clear that to capture Müllerthal, or even to block the southern exit from the gorge, the surrounding hills and tableland had to be won. The infantry and engineers belonging to Task Force Luckett were given this mission, advancing in the afternoon to bypass Müllerthal on the west and seize the wooded bluff standing above the gorge road north of Müllerthal. Tanks pumped seven hundred rounds into the woods to shake the Germans there, but little time was left in the short winter day and the foot soldiers only got across the Müllerthal-Waldbillig road. The center task force (Lt. Col. Miles L. Standish), which had been assigned to help the 2d Battalion, 12th Infantry, clear the enemy from Berdorf, had little better success. Elements of Task Force Standish were strafed by a pair of German planes but moved into Berdorf against only desultory opposition and before noon made contact with the two companies and six tanks already in the village. Then the German gunners laid down smoke and a bitter three-hour barrage, disabled some tanks and half-tracks, and drove the Americans to cover. When the fire lifted the attack was resumed, but the enemy fought stubbornly for each house. This house-to-house assault gained only seventy-five yards before darkness intervened. Meanwhile the sixty-some members of Company F remained in the Parc Hotel, whose roof and upper story had been smashed in by German shelling. Pole charges or bazooka rounds had blasted a gaping hole in one side of the hotel, but thus far only one man had been wounded. Morale was good, bolstered superbly by the company cook who did his best to emulate the "cuisine soignée" promised in the hotel brochures by preparing hot meals in the basement and serving the men at their firing posts. 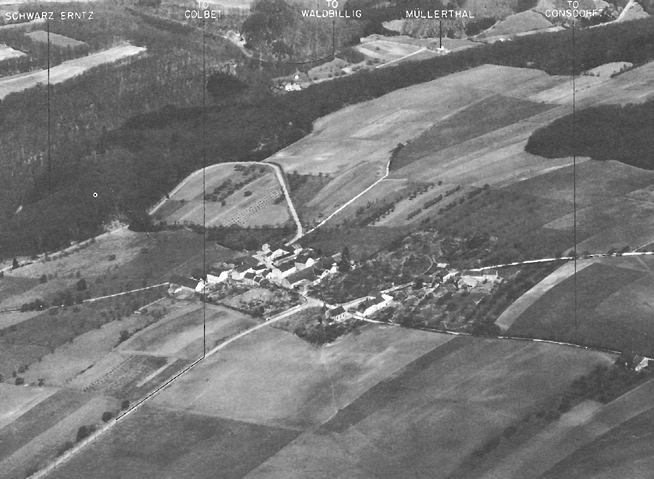 While part of Task Force Standish was engaged in Berdorf, another team attacked through heavy underbrush toward Hill 329, east of Berdorf, which overlooked the road to Echternach. Despite the presence of the tanks, which here could maneuver off the road, the infantry were checked halfway to their objective by cross fire from machine guns flanking the slope and artillery fire from beyond the Sauer. About forty men were wounded, creating a problem for evacuation by this small force. their motors cut and caught the enemy on the slopes while the engineers moved in with marching fire. But a thick winter fog rolled in before the Americans could occupy the hill. Other elements of Task Force Riley meanwhile had advanced to the mill beyond Lauterborn where the command post of Company G was located. Two tanks and two squads of riflemen continued along the main road to the hat factory at the southwestern edge of Echternach where Company E, 12th Infantry, had established itself. Here the company was found to be in good spirits, supplied with plenty of food and wine, and holding its own to the tune of over a hundred of the enemy killed. The tank commander offered to cover the withdrawal of Company E from the city, but Capt. Paul H. Dupuis, the senior officer in Echternach, refused on the ground that General Barton's "no retrograde movement" order of 16 December was still in effect.3 As darkness settled in, the small relief force turned back to the mill north of Lauterborn, promising to return on the morrow with more troops. While CCA, 10th Armored, gave weight to the 4th Division counterattack, General Barton tried to strengthen the 12th Infantry right flank in the Osweiler-Dickweiler sector. The 2d Battalion, 22d Infantry, which had met the German column in the woods west of Osweiler the day before, headed for the village on the morning of 18 December. The last word to reach Osweiler had been that the 2d Battalion was under serious attack in the woods; when the battalion neared the village the American tanks there opened fire, under suspicion that this was a German force. After two hours, and some casualties, a patrol bearing a white flag worked its way in close enough for recognition. Osweiler now had a garrison of one tank company and four understrength rifle companies. As the American reinforcements stiffened the right flank and the armored task forces grappled to wrest the initiative from the enemy on the left, German troops widened and deepened the dent in the 12th Infantry center, shouldering their way southward between Scheidgen and Osweiler. The burden of this advance was carried by battalions of the 320th Regiment (which explains the relaxing of pressure in the Osweiler-Dickweiler area), and the advance guard of the 316th Regiment which General Sensfuss had pried from the Seventh Army reserve by reporting the arrival of the 10th Armored Division. rear of the column and drove an ammunition truck, its canvas smoldering from German bullets, up to the gun crews. The action lasted for over three hours At last two howitzers were manhandled into a position from which they could cover the company; guns and vehicles were laboriously turned around in the mud, and the company withdrew. Farther to the west another part of the German force which had come from Scheidgen surrounded the rear headquarters of the 2d Battalion, 22d Infantry, and a platoon of towed tank destroyers in Geyershof. Tanks en route to Osweiler got word of this situation, picked up twenty-five cannoneers from the 176th Field Artillery Battalion, and intervened in the fight. Covered by this counterattack the battalion headquarters withdrew to Herborn. The engagements at Geyershof and Maisons Lelligen were comparatively minor affairs, involving only small forces, but German prisoners later reported that their losses had been severe at both these points. This fact, combined with the American pressure on either shoulder of the penetration area, may explain why the enemy failed to continue the push in the center as 18 December ended. The net day's operations amounted to a stand-off. The Americans had strengthened the Osweiler-Dickweiler position, but the Germans had extended their penetration in the 12th Infantry center. Elsewhere neither side clearly held the field. Enemy artillery had interdicted many of the roads in the area and had been very effective at Berdorf. American artillery, now increased in the 12th Infantry zone, gave as good support as communications permitted and succeeded in destroying a pontoon bridge at the Echternach site before it could be put in use. Both sides were forced to rely largely upon radio communication, but it would appear that the Germans had particular difficulty: prisoners reported that "nobody seems to know where anybody else is." American intelligence officers estimated on 17 December that the enemy had a superiority in numbers of three to one; by the end of 18 December the balance was somewhat restored. Losses and stragglers, however, had reduced the American infantry companies, already understrength at the opening of the battle. The two companies in Berdorf reported a combined strength of seventy-nine men, while the 2d Battalion of the 22d Infantry listed an average of only sixty in each company. The American makeweight would have to be its armor. Lacking tanks and self-propelled artillery, the 212th Volks Grenadier Division had to rely on the infantry. Accordingly, the 316th Infantry began to cross the Sauer, moving up behind the center of the parent division. be remembered, four rifle battalions still were retained on guard along the twenty miles of the division front south of the battle area. When the Americans resumed the counterattack early on 19 December Task Force Luckett made another attempt to bring forward the extreme left flank in the gorge sector. As before, the maneuver was a flanking movement designed to seize the high ground overlooking Müllerthal. Troops of the 2d Battalion, 8th Infantry (Lt. Col. George Mabry), with tanks and armored field artillery firing in support, first attacked east from Waldbillig to take the wooded nose around which looped the Waldbillig-Müllerthal road. This advance was made across open fields and was checked by extremely heavy shellfire. Next Mabry shifted his attack to the right so as to bring the infantry through the draw which circled the nose. Company E, which had about seventy men and was the strongest in the battalion, led off. By now the German artillery was ranged inaccurately. The casualties suffered by Company E cannot be numbered, but have been reported as the most severe sustained by any company of the 4th Division in the battle of the Ardennes. Casualties among the officers left a lieutenant who had just joined the company in command. Despite its losses Company E drove on, clearing the Germans from the lower slopes before the recall order was given. The division commander now called off the attack and assigned Task Force Luckett the mission of denying the enemy the use of the road net at Müllerthal, a task which could be accomplished in less costly fashion. Colonel Luckett deployed his troops along the ridge southwest of the Müllerthal-Waldbillig road, and a log abatis wired with mines and covered by machine guns was erected to block the valley road south of Müllerthal. Task Force Chamberlain, whose tanks had given fire support to Task Force Luckett, moved during the afternoon to a backstop position near Consdorf. The tank-infantry counterattack by Task Forces Standish and Riley in the Berdorf and Echternach areas also resumed. The enemy resisted wherever encountered, but spent most of the daylight hours regrouping in wooded draws and hollows and bringing reinforcements across the river, stepping up his artillery fire the while. Intense fog shielded all this activity. Apparently the assembly of the 316th Regiment behind the 212th Volks Grenadier Division center was completed during the day. A few rocket projectors and guns were ferried over at the civilian ferry site above Echternach, and about the middle of the afternoon a bridge was finished at Edingen, where the 320th Regiment had crossed on 16 December. The American counterattack on the 19th, then, first would be opposed by infantry and infantry weapons, but would meet heavier metal and some armor as the day ended. a few houses, but were in the process of being reinforced by Nebelwerfers and armored vehicles. Other troops of Task Force Standish returned to the attack at Hill 329, on the Berdorf-Echternach road, where they had been checked by flanking fire the previous day. Sharp assault destroyed the German machine gun positions and the attack reached the ridge leading to Hill 329. Then the advance had to be halted short of the objective in order to free the tanks and half-tracks for use in evacuating the large number of wounded. This ambulance convoy was en route to Consdorf, in the late afternoon, when a radio message reported that the Germans had cut the road north of Consdorf and bazooka'd two tanks on their way back from Berdorf for ammunition. The wounded were left in Berdorf and the task force tanks, hampered by milling civilian refugees, began a night-long fire fight with the 2d Battalion, 423d Regiment, which had concentrated to capture Consdorf. Task Force Riley sent tanks carrying infantry into the edge of Echternach on the morning of 19 December. There they re-established contact with Company E and covered the withdrawal of outlying detachments to the hat factory. The 12th Infantry commander already had given permission for Company E to evacuate Echternach, but communications were poor-indeed word that the tanks had reached Company E did not arrive at the 12th Infantry command post until four hours after the event-and the relief force turned back to Lauterborn alone. The tanks were hardly out of sight before the Germans began an assault on the hat factory with bazookas, demolition charges, and an armored assault gun. Two volunteers were dispatched in a jeep to make a run for Lauterborn, carrying word that enemy tanks were moving into the city and asking for "help and armor." The two, last of the Americans to come out of Echternach, made the run safely despite direct fire aimed by the German assault gun. At Lauterborn, however, they were told that the tanks could not be risked in Echternach after dark. American artillery observers by the failing light saw "troops pouring into Echternach." Orders were radioed to Company E (a fresh battery for its radio had been brought in by the tanks) to fight its way out during the night. It was too late. The defenders had been split up by the German assault and the company commander had to report that he could not organize a withdrawal. Through the night of 19-20 December Riley's tanks waited on the road just north of Lauterborn, under orders from the Commanding General, CCA, not to attempt a return through the dark to Echternach. Although the fighting on 19 December had been severe on the American left, a general lull prevailed along the rest of the line. The enemy made no move to push deeper in the center. The combat engineers in Scheidgen returned to Hill 313 and occupied it without a fight. A few small affrays occurred in the Osweiler-Dickweiler sector, but that was all. By nightfall the situation seemed much improved-despite the increased pressure on the 4th Division companies closely invested in the north. Both flanks were nailed down, and the German attack seemed to have lost momentum. to widen the avenues of penetration behind the panzers. Reports that two new German divisions were en route to attack the 109th Infantry and 9th Armored Division had reached General Morris, coming by way of the 12th Army Group intelligence agencies. If this additional weight should be thrown against the thin American line immediately to the north of the 4th Infantry Division, there was every likelihood that the line would break. It was imperative that the line be held. Troops of the Third Army were already on the move north, there to form the cutting edge of a powerful thrust into the southern flank of the German advance. The 109th Infantry, the 9th Armored Division, the 4th Infantry Division, and CCA, 10th Armored Division, had to win both the time and the space required for the assembly of the American counterattack forces. General Patton, commanding the Third Army, to which the VIII Corps was now assigned, gave General Morris a provisional corps on 19 December, composed of the 10th Armored Division (-), the 9th Armored, the 109th Infantry, and the 4th Infantry Division. Morris, now charged with unifying defensive measures while the Third Army counterattack forces gathered behind this cover, alerted CCA, 10th Armored Division, early on the morning of 20 December, for employment as a mobile reserve. Morris had already dispatched one of his armored infantry battalions to help the 9th Armored in an attack intended to retake Waldbillig. Task Force Chamberlain had been placed in reserve the previous day, but it was not immediately feasible to withdraw the two task forces that were still engaged alongside the 4th Division for it would take General Barton's division a few hours to reorganize on a new line and plug the gaps left by the outgoing armored units. While General Morris made plans to hold the ground needed as a springboard for the projected counterattack, General Beyer, commanding the German LXXX Corps, prepared to meet an American riposte. Higher German headquarters had anticipated the appearance of some American reinforcements opposite the LXXX Corps as early as the third day of the operation. Intervention by elements of the 10th Armored Division on 18 December, as a result, was viewed only as the prelude to a sustained and forceful American attempt to regain the initiative. It cannot now be determined whether the German agents (V-Leute), who undoubtedly were operating behind American lines, had correctly diagnosed the beginning of the Third Army shift toward Luxembourg and Belgium, or, if so, whether they had been able to communicate with the German field headquarters. and forward supply dumps in the Trier-Bitburg area. A large-scale American counterattack against the LXXX Corps could be predicted, but lacking aerial reconnaissance German intelligence could not expect to determine the time or strength of such an attack with any accuracy. General Beyer's orders for 20 December, therefore, called upon the 212th and 276th Volks Grenadier Divisions to crush the small points of resistance where American troops still contended behind the German main forces, continue local attacks and counterattacks in order to secure more favorable ground for future defense, and close up along a coordinated corps front in preparation for the coming American onslaught. On 20 December there was savage fighting in the 4th Infantry Division zone despite the fact that both of the combatants were in the process of going over to the defensive. The 4th Division and 10th Armored sought to disengage their advance elements and regroup along a stronger main line of resistance, and the enemy fought to dislodge the American foothold in Berdorf and Echternach. At the same time elements of the 276th Volks Grenadier Division struck through Waldbillig, the point of contact between the 4th Division and the 9th Armored, in an attempt to push the right wing of the LXXX Corps forward to a point where the road net leading east to the Sauer might be more easily denied the gathering American forces. The team from Task Force Standish had made little progress in its house-to-house battle in Berdorf. Company F, 12th Infantry, retained its position in the Parc Hotel, despite a German demolition charge that exploded early in the morning of the 20th and blew in part of one wall. After a short melee in the darkness American hand grenades discouraged the assault at this breach and the enemy withdrew to a line of foxholes which had been dug during the night close to the hotel. When the fight died down one of the defenders found that the blast had opened a sealed annex in the basement, the hiding place of several score bottles of fine liquor and a full barrel of beer. Lieutenant Leake refused permission to sample this cache, a decision he would regret when, after withdrawal from Berdorf, he and twenty-one of his men were returned to the foxhole line with neither their coats nor blankets. eleven tanks and six half-tracks and made their way past burning buildings to the new 4th Division line north and east of Consdorf. The elements of Task Force Riley, which had waited outside of Lauterborn through the night of l9-20 December in vain expectation that Company E would attempt to break out of Echternach, received a radio message at 0823 that Company E was surrounded by tanks and could not get out. Through the morning rumors and more rumors poured over the American radio nets, but there was no sign of Company E. About noon Colonel Riley agreed to send a few tanks in one final effort to reach the infantry in Echternach, provided that the 12th Infantry would give his tanks some protection. Company G, therefore, was assigned this task. At 1330 a report reached the 12th Infantry that Company E had gotten out. Half an hour later this report was denied; now a message said the company was coming out in small groups. Finally, in the late afternoon, Colonel Chance sent a call over the radio relay system: "Where is Riley?" Thirty minutes later the answer came back from CCA: a section of tanks and some riflemen were fighting at the outskirts of Echternach. This was the last effort. Night had come, Echternach was swarming with Germans, and the 10th Armored Division headquarters had ordered all its teams to reassemble behind the 4th Division lines preparatory to moving "in any direction." Since most of Task Force Riley by this time had reverted to the reserve, Lauterborn, the base for operations against Echternach, was abandoned. Company G, now some forty men, and the last of Riley's tanks withdrew to the new main line of resistance. It is probable that the Americans in Echternach were forced to surrender late on 20 December. General Sensfuss had determined to erase the stubborn garrison and led the 212th Fusilier Battalion and some assault guns (or tanks) in person to blast the Americans loose. The commander of the 212th Volks Grenadier Division received a slight wound but had the satisfaction of taking the surrender of the troublesome Americans, about 111 officers and men from Company E, plus 21 men belonging to Company H. On this same day the Company F outpost which had held out at Birkelt Farm since 16 December capitulated. Finally the enemy had control of most of the northern section of the road net between the Sauer River and Luxembourg-but it was too late. The new American line, running from Dickweiler through Osweiler, Hill 313, Consdorf, to south of Müllerthal, was somewhat weak in the center but solidly anchored at the flanks. The German attack through the 9th Armored sector beyond Waldbillig had been checked. At the opposite end of the line enemy guns and mortars worked feverishly to bring down Dickweiler around the ears of the defenders, but the Americans could not be shelled out. (When one blast threw a commode and sink from a second story down on the rear deck of a tank the crew simply complained that no bathing facilities had been provided.) At Bech, behind the American center, General Barton now had the 3d Battalion, 22d Infantry, in reserve, having further stripped the 4th Division right. And in and around Eisenborn, CCA, 10th Armored Division, was assembling to counter any German attack. Barton's troops and Morris' tanks had brought the 212th and the 276th Volks Grenadier Division to a halt, had then withdrawn most of their advance detachments successfully, and now held a stronger position on a shortened line. The southern shoulder of the German counteroffensive had jammed. The Seventh Army had thrown three of its four divisions into the surprise attack at the Sauer River on 16 December. The Americans had met this onslaught with two infantry regiments (the 12th and 109th), an armored infantry battalion (the 60th), and an understrength tank battalion (the 70th), these units and others attached making the total approximately division strength. The stubborn and successful defense of towns and villages close to the Sauer had blocked the road net, so essential to movement in this rugged country, and barred a quick sweep into the American rear areas. In like manner the enemy had failed in the quick accomplishment of one of his major tasks, that is, overrunning the American artillery positions or at the least forcing the guns to withdraw to positions from which they could no longer interdict the German bridge sites. General Barton, it may be added, had refused absolutely to permit the artillery to move rearward. The failure to open the divisional bridges over the Sauer within the first twenty-four hours had forced the German infantry to continue to fight without their accustomed heavy weapons support even while American reinforcements were steadily reducing the numerical edge possessed by the attacker. Further, the German inability to meet the American tanks with tanks or heavy antimechanized means gave the American rifleman an appreciable moral superiority (particularly toward the end of the battle) over his German counterpart. It should be added that Seventh Army divisions suffered as the stepchild of the Ardennes offensive, not only when bridge trains failed to arrive or proved inadequate but also in the niggardly issue of heavy weapons and artillery ammunition, particularly chemical shells. Perhaps these German divisions faced from the onset the insoluble tactical dilemma, insoluble at least if the outnumbered defenders staunchly held their ground when cut off and surrounded. Strength sufficient to achieve a quick, limited penetration the German divisions possessed, so long as the assault forces did not stop to clean out the village centers of resistance. Strength to exploit these points of penetration failed when the village centers of resistance were bypassed. Successful the American defense in the Sauer sector had been, but costly too. In six days (through 21 December, after which the Americans would begin their counterattack) the units here on the southern shoulder lost over 2,000 killed, wounded, or missing. German casualties probably ran somewhat higher, but whether substantially so is questionable. In any case, about 800 German prisoners were taken and nonbattle casualties must have been severe, for German commanders later reported that the number of exposure and trench foot cases had been unusually high, the result of the village fighting in which the defender had the greater protection from cold and damp.